Renée Gaddis Interiors is a full-service design firm consisting of talented and educated designers who will make sure that the entire design process is pleasant and enjoyable. For nearly two decades, we've had the distinct pleasure of working on some of the finest homes across the country and here in Naples, Florida. Whether it is a formal residence or coastal cottage, our goal has always been to create sophisticated spaces that our clients can fully embrace and enjoy. When you choose our firm, you’ll quickly learn how passionate we are about meeting your needs and vision. Together, we will develop a one-of-a-kind desirable living environment that exceeds your expectations each and every time. We provide residential interior and exterior design services from minor decorating projects to full-scale renovations. Real estate staging also available. Full-service commercial exterior design from conception to implementation. Space planning with 3D CAD renderings. Capability to create custom furniture to accommodate the size and style of your project. We also create custom draperies, bedding and upholstery with on-site workshop and fabric library. We are "The Homeowners Electrician" ~Specializing In Those Little Jobs~ Because you time is valuable we offer our "On-Time" Guarantee.We are honored to have the opportunity to become your electrician. 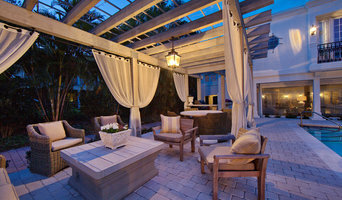 GLORIA BLACK DESIGN is a South Florida-based Interior Design Studio that specializes in high-end luxury design. We believe that true luxury means giving yourself permission to explore your individual style. Whether you are creating a romantic beach cottage, an urban penthouse, or a stately country manor, we take a highly personalized, collaborative approach to your project. The result is a home like no other, with a style uniquely yours. Our clients come from all over and we travel anywhere they need us – from a Florida beachfront estate to a cliffside getaway on California’s Big Sur coast; from a spectacular condo in Chicago’s Gold Coast to a retreat in Michigan’s beautiful Harbor Country. No matter the scope or the setting, our goal at GBD remains constant – to create a space you’ll love. We start by asking questions and listening carefully to your answers. Then our dedicated team will put their creativity and considerable resources to work, ensuring that your project runs smoothly from initial concept through final execution. With years of experience creating award-winning residential and commercial designs, we know what it takes to finish projects on-budget and on-time. Our depth of expertise is matched only by the enthusiasm we bring to your undertaking and our commitment to its success. Eagle Construction & Rehab, LLC.